Statistics Lecture Series (4th Edition) describes the various statistical techniques for analyzing sociological and criminological data. It is designed to increase your understanding of the application and interpretation of how statistical methods are used and misused in social science research. The chapters in this e-book and the videos within it focus on the following topics: (1) basic issues about measurement and frequency distributions, (2) visual and graphic displays of data and how to compute and interpret basic statistics (like means, medians, and standard deviations), (3) how to convert raw scores into standard scores, the importance of the normal curve and other sampling distributions, and the logic of parameter estimation through the computation and interpretation of confidence intervals, (4) describes the logic and procedures involved in various types of hypothesis testing and evaluating claims about population parameter(s), and (5) the methods of bivariate analysis to explore the relationship between two variables, including the techniques of contingency table analysis, ANOVA, correlation, and regression. 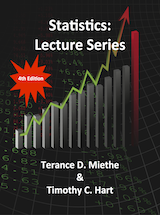 Click the button below to purchase Statistics Lecture Series (4th Ed. ).